From prosthetics to anesthesia, war has been a catalyst for many medical advancements. Modern day plastic surgery traces its roots to World War I, where trench warfare made soldiers especially susceptible to face and head injuries. It’s estimated that thousands of soldiers underwent cosmetic surgery during this time. Plastic surgery has since expanded from treatments aimed mainly at repairing damage to include elective changes like liposuction or tummy tucks. While it’s now a multibillion-dollar industry, just 4% of Americans say they have ever had elective cosmetic surgery, according to a Pew Research Center survey conducted in spring 2016. Less invasive procedures like skin or lip injections are also rare; just 2% of U.S. adults report having had this done. Cosmetic surgery is uncommon among all major demographic groups, but there are some gender differences. Women are roughly three times as likely as men to say they have undergone this type of procedure, and this gender gap is seen across age groups. 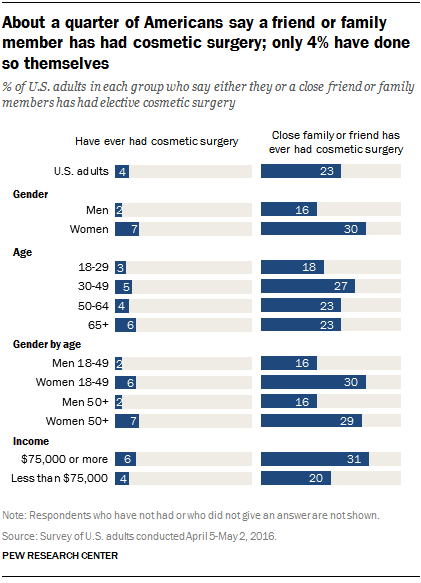 Some 23% of U.S. adults say a close friend or family member has had elective cosmetic surgery. As with personal experiences, women are more likely than men to say a friend or family member has done this. Knowing someone who has had cosmetic surgery also varies by income: About one-in-three adults whose household income is $75,000 or more a year report they have a close friend or family member who has done this, compared with 20% of those whose annual household income falls below $75,000. Overall, more Americans view cosmetic surgery as an appropriate use of technology than say it’s taking technology too far (62% vs. 34%). But six-in-ten also say people are too quick to undergo cosmetic procedures, and less than a third think cosmetic surgery “almost always” makes people feel more confident and better themselves. People’s views about cosmetic surgery are closely tied to whether or not they have undergone these procedures themselves or know someone who has. For example, 85% of U.S. adults who have had cosmetic surgery say it’s an appropriate use of technology, but that share drops to 58% among those who haven’t had this type of procedure and don’t have close friends or family members who have done so. Cosmetic surgery recipients are also more positive about its emotional and competitive benefits than those who have no direct or indirect experience with these enhancements. Some theorists argue that unfamiliar technologies are often initially met with resistance but that attitudes tend to grow more positive over time. That may not be the case with cosmetic surgery. Many Americans are on the fence about its effects on society even though such procedures have been widely available for decades. 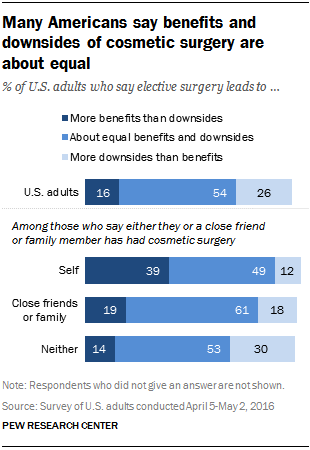 Slightly more than half (54%) of Americans say the benefits and downsides of cosmetic surgery are about equal, 26% say the downsides outweigh the benefits, while fewer – 16% – say there are more benefits than downsides. Interestingly, people who have undergone such procedures are about as likely as the general public to say cosmetic surgery leads to both benefits and downsides for society. They are, however, more likely to hold favorable views about its societal benefits – 39% say there are more benefits than downsides, compared with 14% of those who have not had cosmetic surgery and don’t have friends or family members who had do so. Correction: A previous version of the chart “Americans who have had cosmetic surgery view it more positively than those who haven’t” transposed the labels “Self” and “Neither” in its legend.